INTI International University & Colleges (INTI) recently invited its’ industry partners to come together for their annual Industry Advisory Board (IAB) meeting. The sole purpose of the IAB is to add value to INTI’s current academic program. Their role is to advise and work cooperatively with the academicians to enhance the quality of teaching in the classroom. The members are also volunteers, each are experts in their own industry, meeting to share knowledge on careers and competencies required within the academic discipline. Timothy Bulow, CEO of INTI International University and Colleges during his opening address at the Industry Advisory Board meeting at INTI Subang. On top of providing guidance and sound bites, the members also actively contribute via guest lectures and Employer Projects, an initiative for students to present solutions to real life problems faced by the companies. Such opportunities not only allow students to present their potential to employers and make an impression, but also ensures graduates are career-ready. “Over the last few years, we have made significant efforts to identify a selected group of representatives from the industry, who will be able to provide us with guidance especially on our academic and strategic planning. Today’s meeting, especially with our partners from the Business field has helped us to discuss burning issues in regards to the industry. 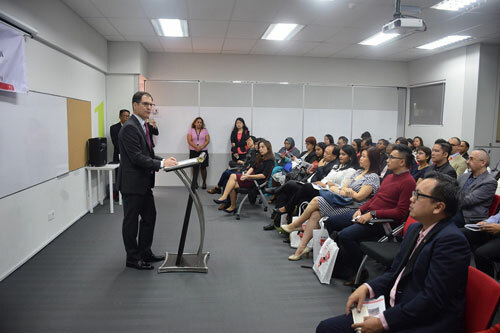 We were able to exchange ideas and recommendations were made – which we will look into assimilating unto our academic teaching,” said Timothy Bulow, CEO of INTI International University and Colleges. In addition to making relevant changes to the academia, the INTI Industry Advisory Board (IAB) has also been influential in developing new programmes, best amplified by the partnership with IBM Malaysia in where INTI introduced the IBM Innovation Center for Education (ICE) program – the first ever program of its kind to be integrated into curriculum. Taught by IBM certified experts, IBM ICE is a series of Undergraduate Programs and Academic courses for the Computing & IT and Business verticals. “IBM has been actively involved as a member of INTI’s IAB, lending their professional expertise to ensure our curriculum continues to meet market expectations. This collaboration is a great example of the effectiveness of the IAB,” Bulow added. The industry partners during a group photo. Sherriza Nor Rashidi, Senior Manager, Human Capital at PwC Malaysia stated, “Over the years, I have been involved in recruiting and developing young graduates who join PwC from various campuses; and the experience has given me a good perspective on the types of graduates who will excel in the workplace. “Our collaboration with INTI, especially on Employer Projects has been great. We recently worked on a project with the students to find ways to improve health care in the rural areas in Malaysia. The students came back with some really interesting findings. We hope to keep this collaboration going. INTI’s ongoing collaborations with more than 450 employers across industries is also one of the key reasons why it recorded outstanding employability outcomes for 2015 as validated by BDO Governance Advisory – with 98% of students being employed within six months of graduating, 25% securing jobs even before they graduate, and 82% being offered higher salaries than the market average.